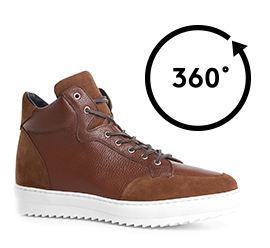 Luxury high-top sneakers, handmade in Italy, with upper in brown calfskin and details tone on tone on the tip, tongue and heel counter. The white sole of the latest generation is made of super lightweight rubber. Laces in real leather. An ideal footwear to enhance every casual outfit. The inner elevator system allows you to increase the total height from 2.4 up to 4 inches depending on the model chosen.